The Baseball Today Coaching Journal is one of the internet's most popular baseball coaching resource sites. We have articles on baseball coaching, basebal training, and baseball fundamentals. Our site features articles on hitting drills, pitching tips, baseball batting practice techniques, baseball practice planning, baseball defensive drills, and more. Your one-stop online store for Baseball Coaching Videos, Books, DVD's, BatAction Trainers, Hit2win Trainers, ZipnHit Pro Trainers, Stay-Back Tees, Hands-Back Trainers, Batting Cages, and More. See one of the internet's largest and most complete inventories of coaching videos, books, and DVD's. Owned and operated by baseball coaches and former players! GOT A BASEBALL QUESTION? ASK US, MAYBE WE CAN HELP. Baseball Book Reviews From Human Kinetics. [Recreation-and-Sports:Baseball] There are some basic points that you must know before buying a batting cage. When you buy a batting cage you are making an investment that should provide you with years and years of top quality batting practice. Here I discuss what I believe are the 12 most important things to consider when you purchase your home, team, school or backyard batting cage. [Recreation-and-Sports:Baseball] The article outlines 4 Baseball Middle Infielder Defensive drills for coaching youth baseball middle infielders. The drills are used to improve fielding skill, teach ground ball fundamentals, build player confidence, and quicker hands. [Recreation-and-Sports:Baseball] Great Coaches are great coaches for a reason. They love the game. They love the kids. They love to instruct and teach. They love to mentor and minister to youngsters hoping that something they do will help that kid become a better person. [Recreation-and-Sports:Baseball] There are many skills and much knowledge that baseball catchers must have to be successful. A good baseball catcher is the foundation of a championship baseball team. If you have a "solid" catcher that can field, throw and "talk" then you are well on your way to building a strong team. Here are 20 coaching points we teach our catchers. [Recreation-and-Sports:Baseball] This baseball coaching article discusses the value of work and how to motivate players to work harder. Working and learning to work are one of the vital elements required in the building of a successful baseball team and program. In baseball coaching work and baseball playing involves a lot of things. [Recreation-and-Sports:Baseball] When the coach gives the runner or runners a steal sign get deeper in the batter box. This extends distance for the pitch coming in and the throw by the catcher. This slight movement may give the runner a little more time. [Recreation-and-Sports:Baseball] The "Major League" baseball swing is a thing of beauty. If you watch it in slow motion, you will see that there are 3 common elements of the swing that that most major league baseball players have in common. Baseball batting practice repetition makes the Major League Baseball Swing consistent with the same 3 basic elements exhibited with every swing of the bat. [Recreation-and-Sports:Baseball] Every baseball team's fortune lies in the hands or the "arm" of the pitcher on the mound. This can be said for pitching at every level from Little League Baseball to High School Baseball to College Baseball and to Major League Baseball. As I was watching the College World Series on ESPN last June, I noticed that every pitcher did the little things perfect. Every pitcher had basically the same approach to the game. Every college baseball pitcher in Omaha tried to get ahead of the batters, pound the strike zone with good pitches, and let their defense make plays behind them. [Recreation-and-Sports:Baseball] Adding variety and preventing boredom is an attribute of great coaching. Little league and youth baseball practice can be both fun and productive at the same time. Great coaches know the importance of having a pure fun day every one and a while. The game "Shove-Up" is definitely not an activity that you would use every day, but as a "change of pace" activity, it serves well to motivate kids and teach competitiveness. How is "Shove-up" played? [Recreation-and-Sports:Baseball] I know that the title got your attention. Everyone knows and respects the Major League Baseball players like Derek Jeter, Albert Pujols, Alex Rodriguez and Manny Ramirez. Many parents dream of having their little league player growing up to play college baseball player and Major League Allstar. Do you know and realize how small the actual percentage is of little league baseball parents that ever see that dream come true? Just helping your kid become a solid little league player that loves and enjoys the game of baseball should be the goal of every baseball parent. [Recreation-and-Sports:Baseball] We all know the importance of good base running. We know that "solid" base running scores runs and wins games. We also know that poor base running can easily cause a team to lose a game. The following two stories are true stories of base running mistakes that cost the team a win. All the team had to do to win was to have the base runner advance to the next bag. These two stories are great stories that you can tell to your players to teach young players two important rules of base running. [Recreation-and-Sports:Baseball] Every one of us has at one time or another, either as a player or a coach, had to face what is considered the "unhittable" pitcher. You know what I mean, the pitcher that is undefeated because he has an overpowering fastball, nasty curve ball, and a 3 pitch arsenal of potent pitches that intimidates the average team while he is just warming up. Coach Dixon discusses is strategies that can used when your team faces a dominating and overpowering pitcher. The main strategy in this situation is that you must have a "strategy" that you and your kids believe will work. The trick is have several scenarios and plans that you will apply as the game progresses. [Recreation-and-Sports] Volunteering to coach youth sports can be one of the most rewarding experiences in your life. It is a privilege to spend time teaching, coaching and mentoring youngsters in one of the most critical stages of their mental and physical development. Many kids do not have positive role models in their life. Many kids do not get the attention and the discipline that they need and desire. The main thing I want to discus today is the importance of thinking before you speak and the fact that your words greatly affect the self esteem of your players. [Recreation-and-Sports:Baseball] There are two simple actions that a pitcher can use to distract or disrupt a batters concentration. The two actions are the "double pump windup" and the "start over" pitch deliveries that are done to change a pitchers regular windup. Both of these actions are used when there are no base runners on base. They both serve as effective ways to disrupt the concentration of opposing batters. [Recreation-and-Sports:Baseball] Young pitchers need frequent practice. Daily practice allows players to improve daily and it also allows the coach to observe and see any bad habits or flaws that a young pitcher may have "picked up". There are 4 Common Pitching Flaws of Young baseball Pitchers that a coach should identify quickly and correct. Here is a brief description of each of these flaws and a coaching point related to each. [Recreation-and-Sports:Baseball] I have compiled my list of the "MUST DO'S", that I feel every coach must coach by! These reflect the duties and responsibilities accepted when one becomes a coach. Here are my "MUST DO'S". [Recreation-and-Sports:Baseball] There are many four letter words that baseball coaches know, but few are as important as the word for today, PLAN. There are very few volunteer jobs more challenging, time-consuming or rewarding than being a coach in your local league. [Recreation-and-Sports:Baseball] Learning correct baseball pitching mechanics are the first step in the making of a pitcher. Once proper mechanics are mastered these two drills can be used to hone skill, increase concentration, build confidence, and improve control. Here are two drills that can bed used to help improve a pitchers control. The two drills are "Pitch Tracking" and the "20 X 4" Pitching Drill. [Recreation-and-Sports:Baseball] Coaching youth and high school baseball batters requires a watchful eye and close attention to detail. Baseball coaches must identify and correct any flaw in a batters hitting mechanics. Players should not be allowed to practice their swing over and over without correcting their mistakes. Good baseball coaches are always on the constant lookout for any bad habits that a young player may develop. Here I discuss three of the most common hitting mechanical flaws and my approach to correcting each. [Recreation-and-Sports:Baseball] Wasting time is something that baseball coaches should avoid. There is nothing more precious to a player, to parents, or to assistant coaches than time. Time spent at the baseball field must be considered valuable or constructive time. We are coaches because we love the game and we want to help young players grow up to great adults. [Recreation-and-Sports:Baseball] Hitting a baseball is a skill that can be learned and improved with proper coaching and instruction. It may be a difficult task, but with the correct fundamentals and techniques hitting can be one of the most rewarding activities in all of sports. There is nothing that is more satisfying and rewarding than hitting a line-drive in the left-center gap to help your team score the go-ahead run. [Recreation-and-Sports:Baseball] If you watched the College World Series on ESPN last June, I am sure that you saw, as I did, player after player, use the no-stride technique. The batter after batter, came to the plate, at the College World Series in Omaha, and used the No-Stride Method of Hitting. Baseball coaches at all levels of baseball, from little league to the pros, are teaching the "wider stance and no stride approach" to hitting. Here I cover the basics of teaching and coaching the "No-Stride" hitting method. [Recreation-and-Sports:Baseball] The eyes are the hitter's brain when it comes to hitting. A batter can know the count, know the situation, know the pitcher, and know how to swing, but if the eyes are weak or fail, then they will likely suffer defeat at the plate. How many times have we heard a successful batter say that "I am really seeing the ball right now"? Batters that are "hot" at the plate always say that they are really seeing the ball well. [Recreation-and-Sports:Baseball] When you watch several elite baseball batters hit the ball, you quickly see some common traits. The great high school, college, and pro baseball players all generate incredible power with the lower body, legs, and hips. A good baseball swing incorporates the hips and lower body into the swing. Most of the batter's power is generated by the hips and the leverage created by the front leg. How many times have you heard the following "That batter swings with all arms, and has no power"? [Recreation-and-Sports:Baseball] Baseball coaching is teaching the big and little details of the game. Every position or location on the field requires a player to observe and to be aware of what is happening. Many young batters on deck often do no pay attention to what is happening. They are often guilty of looking into the crowd or even talking to someone through the fence. On-deck batters that do not closely observe the pitcher and the catcher are missing a greatly opportunity to "scout" the opponent. [Recreation-and-Sports:Baseball] Fewer things in baseball are more embarrassing for a young baseball player than to make a base running mistake that cost his team a run. Some of the most devastating and demoralizing mistakes in baseball are made by baserunners at 3rd base. When a runner gets to third, the team momentum and confidence is increased. The team and the player, and the fans feel like they are going to soon score a run. But, to have that chance of scoring removed by a blunder by the runner or coach can take the momentum completely away from the team. [Recreation-and-Sports:Baseball] The coaching of baseball pitchers does not require a degree in "pitchingtology". There is no such degree to my knowledge. I just made that up. My point here is that coaching baseball pitching is not rocket science. However, having a basic knowledge of the terms and mechanics is a must. [Recreation-and-Sports:Baseball] The skill of throwing a good curve ball accurately is a skill that must be taught and coached. Teaching curve ball control and accuracy is vital to a pitcher's success at any level. Here I discuss the method I use to teach and coach our high school pitchers to vary their curve ball location and to accurately control the spot to which the ball will break. 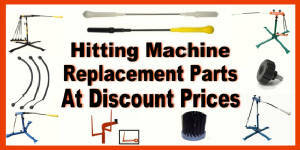 Buy your Baseball and Softball Training Equipment for less at Baseball Dealz Ebay Super Store. 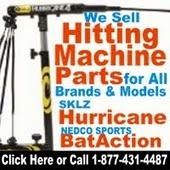 BattingCageBuilder.com is the Ultimate Information Site for anyone considering buying or building a batting cage. The BatAction Hitting Machine has been helping hitters improve their swing since 1999. 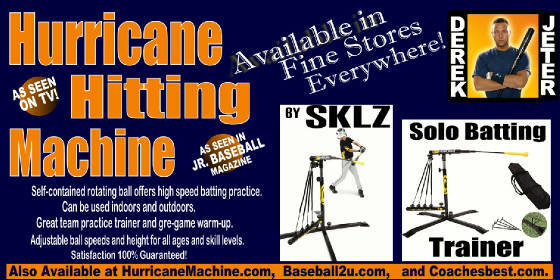 The new Derek Jeter Hurricane Hitting Machine as seen on TV. Youth Baseball Digest - What is on Base Percentage? How is on Base Percentage Calculated? [Recreation-and-Sports:Baseball] On Base Percentage (OBP) is a vital baseball statistic that tells how effectively a batter is getting his job done at the plate. On baseball percentage is often referred to the OBP. On Base Percentage is often referred to as the "on base average" or OBA. [Recreation-and-Sports:Baseball] If you have a young baseball pitcher that at times looks like a Josh Beckett or Randy Smith and other times he struggles to throw two strikes in a row, what can cause of his control problems? There are 10 key elements of his delivery that should always be checked first. Those key elements are outlined in this article. [Recreation-and-Sports:Baseball] Baseball coaches and umpires often have a love/hate relationship. Coaches often make an umpire's job difficult. Umpires sometimes ruin a coach's day with a crucial call. Coaches expect a high level of professionalism from the umpires in the crew working a game. Umpires expect a high level of professionalism from the coaches of both teams. Here I outline 5 things coaches expect of umpires and 5 things umpires expect of coaches. [Recreation-and-Sports:Baseball] Individual and team batting averages are one of the best indicators of how effective your practice drills and game preparation is. Batting average is a simple 3 digit number that expresses how often a batter has gotten a hit for the total number of at-bats. There is a simple formula used to determine your batting average. This articles clearly explains how your average is calculated. Baseball Coaching Digest - Baseball Strategy - What is the 5 Infielder Defense? When is it Used? [Recreation-and-Sports:Baseball] Utilizing a 5 infielder defense is a rare strategic move used by coaches of the visiting team when the home team is in their last at-bat and the winning run is on third. Though it is extremely rare to see this strategy employed, it is a defensive strategy that every baseball coach should know about. What is the 5 Infielder Defense? When is it used. That is the focus of this article. [Recreation-and-Sports:Baseball] Two Batting Cage Myths that are simply not true are (1) A Batting Cage must be long for it to be usable for all ages and (2) A batter must see 75 mph pitches to receive maximum benefit from cage work. This article discusses how many batting cage buyers are mistaken or misled in buying or building a new baseball batting cage. [Recreation-and-Sports:Baseball] Derek Jeter's mental approach to baseball is one that every player, coach and parent should take notice of. He is a true American Sports Hero yet he does not consider himself bigger than the game itself. His words and quotes reflect his attitude, his commitment, and his love of the game. What can all baseball coaches learn from Derek Jeter's mental approach to the game? He is one of the most "decorated" Major League baseball players in the past decade. But, more impressive than his talent is his ability to keep the game in proper perspective mentally. He is humble. He knows how important the game is to him. He appreciates the opportunity he has to play the game and he considers it an honor to wear the pin stripes. In this article I present Derek Jeter quotes that I feel reflect how every player should approach the mental part of the game. [Recreation-and-Sports:Baseball] All successful Little League Baseball Coaches have common characteristics that make them a "cut above" average youth baseball coaches. These character traits enable the successful baseball coach to have top quality practices and to get great game performances from his team. Successful coaches are able to compete season after season. They often coach their teams to championships. This article outlines what I consider to be the 7 character traits of successful Little League Coaches. [Recreation-and-Sports:Baseball] It is important that all coaches and parents that use a pitching machine with players know the dangers involved. There are definite safety precautions that should be observed to insure the safety of all players, coaches and parents during pitching machine use. This article outlines 10 safety tips that teams and families should remember to follow to insure that no injuries occur during the use of a pitching machine. Youth Baseball Digest - What is a Hitting Spray Chart? How is a Spray Chart Used? [Recreation-and-Sports:Baseball] A hitting spray chart is a scouting chart showing where opposing hitters have hit the baseball in previous at-bats. The Spray chart is used to help a defensive team determine how to pitch an opposing hitter and how to set the defense for that particular player. This article covers the basics on how to make your own spray chart and how to use it to give your team an advantage. [Recreation-and-Sports:Baseball] Coaching Little league is a great way for baseball and softball players to give back to your community. Every baseball player remembers his first t-ball coach, coach pitch coach, little league coach, and high school coach. Baseball coaches have a profound effect on the lives of the players they coach. [Recreation-and-Sports:Baseball] Player and coach safety must be the concern of every Little League Baseball Coach. All youth baseball coaches must establish certain team rules to insure the safety of both the players and the coaches. There are 5 basic safety rules that help protect players are coaches. This article outlines each of those 5 safety rules. Youth Baseball Digest - What Constitutes a Productive At-Bat? What Makes an Out a Productive Out? [Recreation-and-Sports:Baseball] Having players go to the plate and have quality at-bats and productive outs are the keys to offensive success in baseball. We do not like wasted outs. In youth baseball, you team is allowed only to get 18 or 21 depending on your leagues rules. Baseball Coaching Digest - When Can a Pitcher Throw to an Unoccupied Base Without Balking? [Recreation-and-Sports:Baseball] The answer to this often debated question is yes. The pitcher is allowed to throw to an unoccupied base if a runner is making an attempt to reach that base. The pitcher does not have to step off or clear the runner to make this throw. Here I explain the situation and the rules that apply. [Recreation-and-Sports:Baseball] Every baseball player loves to hit the ball hard and far. The power required to hit the baseball deep comes from the generation of maximum bat speed. The generation of bat speed is created by the correct use of the lower body, hips and hands. Four key elements are required to make the batting swing more powerful. This article outlines and explains those key elements. [Recreation-and-Sports:Baseball] It can be very frustrating to have a talented young batter go into a mid season slump. This is going to happen to at least one or two players on every youth baseball team in America this summer. [Recreation-and-Sports:Baseball] The 3 biggest mistakes parents make when they buy a new baseball bat are: 1) Buying a Bat that is Not Appropriate, 2) Buying a Bat with the Wrong Intentions, and 3) Buying a Bat That is Illegal. I will now explain each of these mistakes. I will now offer explanations of how these mistakes are made. And I will tell how each of these mistakes can be prevented. [Recreation-and-Sports:Baseball] There is nothing more beautiful in sports than when a "major league" swing whether it be at the tee ball, little league, high school, college or Major League Baseball level of play. A "major league" swing is what I consider to be a perfectly executed swing. [Recreation-and-Sports:Baseball] These 3 batting drills should be a part of every serious baseball players daily batting practice routine. These hitting drills are well known and recognized for increasing bat speed and power. If you use these three strength building drills regularly, they to make your baseball bat the most powerful in your baseball league. These drills should be done regularly during the off season. [Recreation-and-Sports:Baseball] Tee Ball is the very first experience that most baseball players have with the game of baseball. There are physical skills that must be learned. There are mental aspects of the game that must be learned. But, there is no more important elements of the game that a player must learn than the basic rules of the game that provide safety and protection for the players, coaches and umpires involved. [Recreation-and-Sports:Baseball] The "In-field Fly" rule is one of the most intimidating, confusing, and misunderstood rules in baseball. The rule is often a point of controversy among coaches, players and spectators watching the game. Many ask, "Why do we have the 'In-field" fly rule? When does the "In-field Fly" baseball rule apply? Here I outline the reason for this rule of baseball, the situations under which this baseball rule applies, and other information to help you better have a better understanding of it. [Recreation-and-Sports:Baseball] One of the most frustrating and often puzzling things to witness in youth baseball coaching is "game time" failure that was totally unexpected.. We have all seen it happen at one time or another. You have a player that absolutely rips the ball in batting practice but looks horrible at the plate whenever he bats. Before the games started the player was expected to be one of the best hitters on the team. But, when season starts and the games begin he is absolutely terrible at the plate. I am assuming that the batter has a swing that is mechanically sound. [Recreation-and-Sports:Baseball] We have all seen this scenario. The batter has above average bat speed, above average hitting skill and is always extremely aggressive at the plate, but is simply not getting on base. The swing looks great but weak or poor contact is made. The batter is in a serious hitting slump. [Recreation-and-Sports:Baseball] The word "excuse" is a bad word to most coaches. A parent excuse is a reason given by a parent to explain or justify their son's poor performance, tardiness, or inappropriate behavior. Coaches really would prefer that someone simply say they were wrong or give a legitimate reason rather than a ridiculous excuse. The Baseball 2Day Coaching Journal surveyed baseball coaches. One of the questions was "What is the worst excuse you ever heard from a parents? Here are the top 10 worst parent excuses of all time. Baseball Coaching Digest - Can You Name 20 Ways to Score From Third Base? [Recreation-and-Sports:Baseball] How many ways can you think of that a runner can score from third base. I am a firm believer in the strategy of getting the runner to third with less than two outs any way you can. Below, I have listed 23 ways of scoring a runner from third base that do not score the same runner from second base. [Recreation-and-Sports:Baseball] Great hitters at all levels share one common skill. They know when and how to attack every pitch location. Great hitters read and react to every possible pitch location. If you watched the 2008 Baseball College World Series, you quickly realized that great college hitters can catch up to any fastball regardless of the velocity. You also saw college baseball batters that apply and execute one of the most important and basic skills of hitting a baseball, the skill of "hitting the ball where it is pitched". [Recreation-and-Sports:Baseball] In coach pitch baseball and youth baseball the batters are getting their first experience at hitting live pitching. Here are few things that youth baseball coaches should say to youth baseball batters during an at-bat. These communications are most often conveyed to the better by the 3rd base coach. [Recreation-and-Sports:Baseball] This article explains one of the most important roles that your catcher will play in every game. The role is that of being the team's public relations representative with the umpire staff. The catcher's attitude and behavior can have a huge effect on an umpire's attitude. [Recreation-and-Sports:Baseball] Coaching Little League or Youth Baseball requires a good knowledge of the game. Many good youth baseball coaches have never played the game before. They make it their mission to study and learn the game. This article presents a list of 25 common baseball coaching terms and gives the meaning of each. [Recreation-and-Sports:Baseball] There are certain base running rules that every base runner should learn. Here is each base and basic rules that players should know about each. [Recreation-and-Sports:Baseball] The perfect baseball swing is a thing of beauty. There are few movements and actions in sports that are practice more often than the baseball swing. Players take thousands and thousands of practice swing during a season. The key to game swing quality is practice swing quality. There are certain basic rules that every batter should remember when taking a swing in practice and games. [Recreation-and-Sports:Baseball] It is important that very young baseball players receive proper instruction in baseball hitting mechanics. Young baseball players benefit greatly from top quality instruction and teaching that is easy to understand, simple to execute, and consistent from one lesson to another. [Recreation-and-Sports:Baseball] Article discusses the Fake Time Call trick play used by baseball teams to disrupt the motion and concentration of young baseball pitchers. Coaches should warn their pitchers, particularly young pitchers, not to fall victim to this trick play and underhanded play used by some teams to draw a balk. [Recreation-and-Sports:Baseball] This article is about 4 relatively inexpensive components that are valuable baseball coaching tools that are available in your favorite mass merchant store. I feel that these components should be in the carry bag of every baseball coach at every level of play. [Recreation-and-Sports:Baseball] The "First and Third Double Steal" situation is when the batting team has a base runner at first base and a base runner at third base. Often times the offensive teams will put on a base running play to attempt and confuse, fool, or trick the defensive team into making a mistake that will cost them a run. [Recreation-and-Sports:Baseball] Bunting is a skill that must be learned and practiced on a regular basis. It is often one of the most neglected aspects of a team's offensive strategy. There are various techniques of bunting and each should be taught and practiced. This article discusses 10 coaching points of teaching players how to execute a sacrifice bunt. [Recreation-and-Sports:Baseball] This offensive play is called "Deep Lead in Right Field". The play is run when a team has base runners at 1st base and 3rd base. The play is used to put pressure on the defensive team in an attempt to force an error that will allow the runner at 3rd base to core. [Recreation-and-Sports:Baseball] Article discusses 10 bad habits of bad Little League Coaches. These bad habits make it impossible for a coach to be an effective coach and role model. [Recreation-and-Sports:Baseball] Here are important points and skills that you must teach your First Baseman. Tips cover teaching the proper way to get to the bag, set up to receive the throw and how to stretch. [Recreation-and-Sports:Baseball] This 1st and 3rd Double Steal Play known as the Stop and See Steal. This play is used by offensive teams to score a runner from 3rd base by stopping the stealing runner short of the bag and tag. [Recreation-and-Sports:Baseball] The Fake 3rd Out is a trick play ran by defensive teams to trick an unsuspecting base runner. If the base runner is not alert and aware, he may step off the bag and give the defensive team a cheap out to end the inning. Coaches should make their players aware of sure plays and tactics to prevent this trick from happening to their team. [Recreation-and-Sports:Baseball] There are very few volunteer jobs more challenging, time-consuming or rewarding than being a coach in your local league. There are many four letter words used by coaches that I can not use here. Here I want to discuss the 4 four-letter words that can and will determine the amount of success a coach has during the coming season. The four words are Goal, Plan, Work and Time. [Recreation-and-Sports:Baseball] Teaching, training and developing young baseball pitchers takes a lot of time, patience, and practice repetition. Many young pitchers need to practice pitching skills daily. To keep the interest level high, it is best to use a variety of drills on alternate days to prevent boredom. Here are 4 baseball pitching drills that can be used to train youth and beginner pitchers.